You know what’s so ironic about my fear of the front brakes? I’ve never really had a lowside crash, which while can be caused by factors other than too much front brake (i.e. 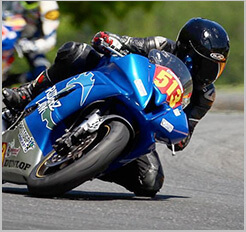 over-leaning), is typically due to over-use of the front brake when turning in or trail braking to the apex. Bikes typically slide to a stop during a lowside crash. My buddy’s bike in the picture decided to be atypical. I’ve had moments, when the front wheel would fold from losing side-grip, but I have been fortunate enough that the tire would regain grip immediately to keep the bike and I from falling over. The last time I had the front wheel fold on me during cornering, it was due to my front tire being long overdue to be replaced. But no, I haven’t had a lowside crash (knock on wood!). A smashed tank usually goes without saying after a highside crash. Usually. Which is why, as I had written about previously, I am also a tad fearful of the throttle as I am of the front brake. Although I’m more fearful of the latter than the former, fact is I have been bitten by too much throttle too soon, so I know exactly what the punishment is like. However I will say that much like having experienced the front tire folding on me, I have also experienced the rear tire sliding from too much throttle while leaned over, without catastrophic aftermaths. What I have noticed is that a sliding rear – personally speaking – isn’t as abrupt as the front end folding. This is all relative of course, as either incidents do happen quickly, but there is still a distinct degree of quickness between the two, that I feel I can control a sliding rear on the throttle a lot better than a folding front on the brakes. 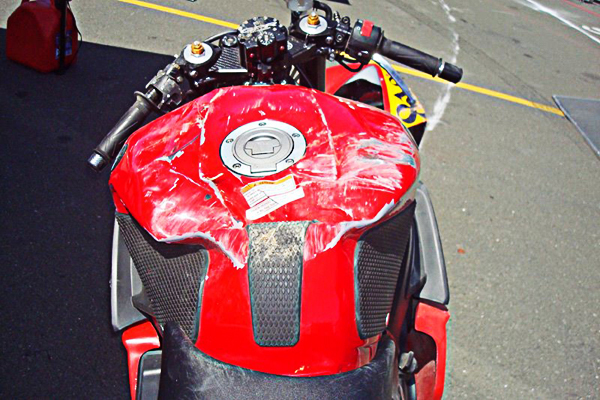 I wish I can be a proponent of one type of crash over the other, but in my years of track riding, I’ve seen each type of crash produce relatively small damage to the rider and the bike, as well as each one resulting in serious trauma to both. Honestly, if or when they happen, it’s just the luck of the draw on what the outcome will be to you and your machine. It should go without saying, but the best types of crashes are the ones that you avoid.